It's been block-tastic round here over the weekend. The mojo had definitely returned! Despite still having morning sickness (in the evening) I've been working round it and I'm not feeling so exhausted anymore so I'm going to sew all I can! This quarter I'm going for it!! - First up a baby quilt that HAS to be finished for my very dear friend who's due next month! I can't show anything except the fabrics because she reads the blog and I don't want to give anything away! - I was trying to get an embroidery-to-go bag made before the Fat Quarterly Retreat but only got as far as the embroidery and some cutting and I really want to turn it into a cute bag! - The Retro Flowers QAL - The QAL has finished and I've still only done 1/2 one block!!! hahaha! Although I have done all the cutting so it just has to be SEWN! but since it's a pic of me I'm sure she won't mind! 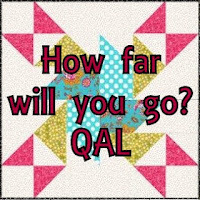 - I also have a little project that I'm making as a Fat Quarterly challenge using some yummy fabric. I have it planned and have done a bit of cutting but need to finish this up asap! 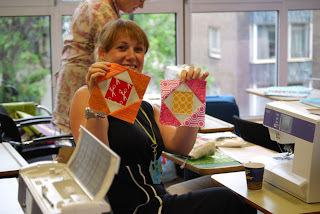 Blocks for the fabulous Queen Bees of Scrappy? Sew bee it! Because of not feeling so hot I got really behind and can only apologise to those who are getting the blocks late - I hope you will understand and forgive me!! May's block was for the fabulous lady that created the bee, May of Confession of a fabraholic. I really enjoyed making this block, having never done one before. I was a bit intimidated but it came together so easily and was a lot of fun to do. June's block was for Annika of Quiltar och Silver. I have attempted a log cabin block before but I think my seam allowance was off and it looked all wrong but thankfully this went together nicely! I love her white, yellow and blue theme. I love her idea for this quilt. We all make blocks using 2.5" squares of scraps in any simple design and use different greys for the background. The idea is that one of the blocks on the outer edge will meet up with each other so it will be like a big puzzle when it's all put together! I'm looking forward to seeing this one finished because it will be so original. I got them all in the post today so they are winging their way to different parts of the world! I've picked out the fabric I'm going to use. I started with a bundle designed by Adrianne that I won from her blog Little Bluebell and then added some extras. I think it'll work well. Now I'm going to crack on with the sewing before my mojo runs out! Wowee! So much beauty accomplished! You are ahead of me....that's for sure! I don't know where you get your energy from - I'm exhausted from just reading about all those projects! Glad you're feeling better though! yikes, that's a lot! i'm glad you're feeling better enough to sew again, even if you're not 100%! wonderful bee blocks. that blue center green petals on white daisy dot fabric is to DIE for. your little thread girl makes me smile. and you look so cute in that picture, holding such cute blocks too! also, i'm quite liking that mug you got laura, how do i find one? wow miss Lucy you are a powerhouse of activity! Glad you found that mojo again! Look forward to seeing those projects finished! Oh, you are doing all this while pregnant, evening sick and also tired all the time?!?! I feel like such a slacker! But what a great list. Good luck. lovely blocks! Don't know how you find the time! Blimey woman, pregnancy seems to suit you! You make me tired just looking at your list! Good luck! Your bee blocks are great! I am glad you are feeling better and good luck on your list! I tried to resist the stash club, but I grew weak over the weekend! You are a busy bee! Love that photo of you keep it for the kids when they are grow! You look so happy, must have been a good day! Take care! What a lot of lovely bee blocks! Don't you worry about your retro flowers - I have only made 4 of my flowers, so we can have our own little leisurely quilt-along with no deadline!! what a lot of work you want to do and have been doing!! v impressive mrs! glad your mojo has returned also. How have you found the retro flowers easy, hard ??? WOW! Your blocks are fantastic! For as out of commission as you say that you were, it seems you have been very productive, too! I am dying to try paper piecing. I know how to make a basic quilt with squares, but you are convincing me to try more techniques! Congratulations on the baby news! That's oh so very exciting! Your embroidered bag on your last post is adorable, as well! So much done! Love it! Woah, mojo has returned with vengeance! Awesome work lady! That stack will be perfect for the QAL! So many lovely blocks and pieces of fabric/WIPs in this post - have fun with them all!